Ashok Leyland, the Hinduja Group flagship and India’s second largest commercial vehicle manufacturer, launched the ‘Luxura Magical India Bus’, with Toofles Foundation, in support of ‘Charter for Charity’, a new concept in India. 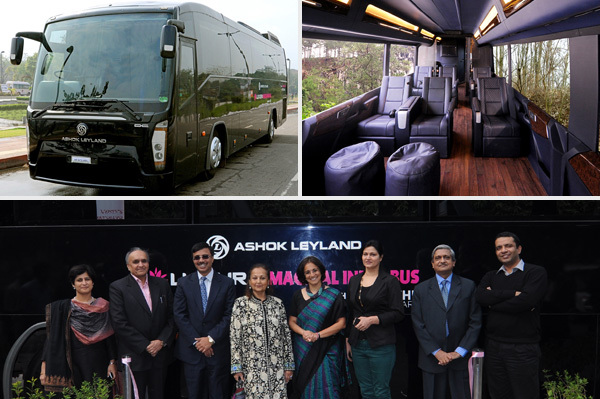 The bus that has been re-modelled into a super luxury liner by the world renowned auto designer Dilip Chhabria will be operated by Mann Travels with The Park also on board as Hospitality partners. Another unique aspect of this venture is that 50% of the proceeds from the operations of the bus will go to the charity partners to the venture - ‘Goonj’, an NGO and the Cancer Institute (WIA). The ‘Luxura Magical India Bus’ was launched at The Park today in the presence of Mr. Vinod K. Dasari, Managing Director, Ashok Leyland, Mr. Dilip Chabbria, DC Designs, Ms. Parmjeet Mann of Mann Travels, Ms. Priya Paul of the Park Hotels and Ms. Madhabi Buch, Founder & Advisory Committee Member, Toofles Foundation. The Bus: The ‘Magical India Bus’ has been specially designed with just nine luxurious reclining seats. The super luxury liner is equipped with a spa - with two therapists on-board, a kitchen, a wash room and all the other trappings like passenger entertainment, information systems and individual controls. The bus is also Wi-Fi enabled. Making a difference: Guests can charter the bus for a day or for an overnight trip to Agra, Jaipur, Neemrana or to any of the numerous travel destinations in and around Delhi. Families, Corporates and Tour Groups who charter this special service will enjoy a unique experience of luxury travel, door to door. And at the same time know that they are making a difference by contributing to the amazing work being done by Goonj and the Cancer Institute. Madhabi Puri Buch, Founder of Toofles Foundation, that has put this project together, said "It is just a small way for us to invite everyone to enjoy a luxury service and experience the joy of giving… all the same time… that, is the Magic of India!" Bookings can be made by calling +91 81303 44466. View complete Images here of Bus here.